When the Erskine Old-Timers were recorded by Phil Nusbaum in the 1980's, they had already been going as a band for more than 40 years. The three original members were Bernt Odegard, fiddle; Bloyd Talge, banjo; and Vernes Trandem, bass. In this recording they were joined by Dove Machart on piano. 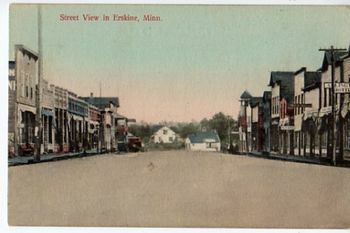 Erskine is a town in Northwestern Minnesota with a population of 509. I have listened to hundreds of hours of Minnesota recordings for this project. The Old-Timers are my favorite of them all. Something about the way they play really hits home with me.